9 to 5 Computer the authorized dealer for the Garner SSC-25SSD The HD-2SS uses Garner's proven solid-state technology to generate a high-powered erasure field that’s far superior to the fields produced by the read/write heads in hard drives and tape drives. Unlike overwriting, the HD-2SS generates an erase field that encompasses the entire hard drive or tape, leaving no area unchanged. The HD-2SS requires no physical connection, such as a cable, enabling it to erase data on working and nonworking hard drives. Degaussing technology also makes the HD-2SS software independent, allowing you to completely and permanently erase any magnetic hard drive or tape, regardless of the operating system or interface. NEW Mobile Destruction Unit IRONCLAD Erasure Verification System Two of the most important data-security policy requirements emerging from IT departments, healthcare facilities, government facilities, and data centers are: Data erasure and destruction processes should be performed inside your business' secure facility to maintain chain-of-custody and prevent data breaches due to physical loss and/or theft of the media. Data elimination and destruction must be accurately tracked, documented, and preserved to withstand security audits. 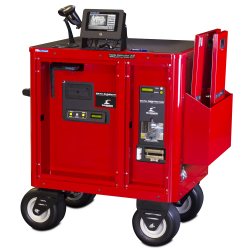 The Garner SPACESAVER Regulatory Compliance in a Small Footprint Contact 9 to 5 Computer authorized dealer for the Garner complete, secure hard drive & solid-state media disposal solution. 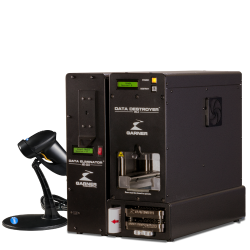 The SPACESAVER Compliance Package includes the HD-2SS Degausser, the NSA/CSS EPL- listed PD-5plus hard drive destroyer, SSD-1 solid-state media destroyer, SSD-CADDY, SSD-MT10 media transport sleeves, and the SCAN-1 media destruction report generating scanner and software. Ideal in compact office spaces, the PD-5 fits securely on top of the SSD-Caddy that conveniently holds the SSD-1 and SSDMT media sleeves.